I was lucky enough to be able to stay at Anantara Vacation Club Phuket Resort for 5 days. It is on the north west of Phuket and near the beautiful Mai Khao Beach, pictured above. We hired a car so we could get around the island as this was my first time in Phuket, even though the resort had all we needed. We stayed in a suite and it was beautiful. I will add some more photos to show you. The suite had a full kitchen which we used to make some of our meals. There are also a restaurant and an outdoor pizza bar. We tried one of the pizzas and I have to tell you it was an excellent traditional style thin crust pizza of prosciutto and rocket. The restaurant also had theme nights. On the night we arrived the theme was Barbeque...very nice! On another night the theme was seafood buffet. This is the living area with the kitchen at the back of the room. The living area has a 50 inch TV and a stereo and TV's in the bedrooms. The bathroom has two sinks, one each side, a huge shower, beautiful toiletries and that huge 2 -3 person bath. A sunset view from the balcony, looking out over Anantara. 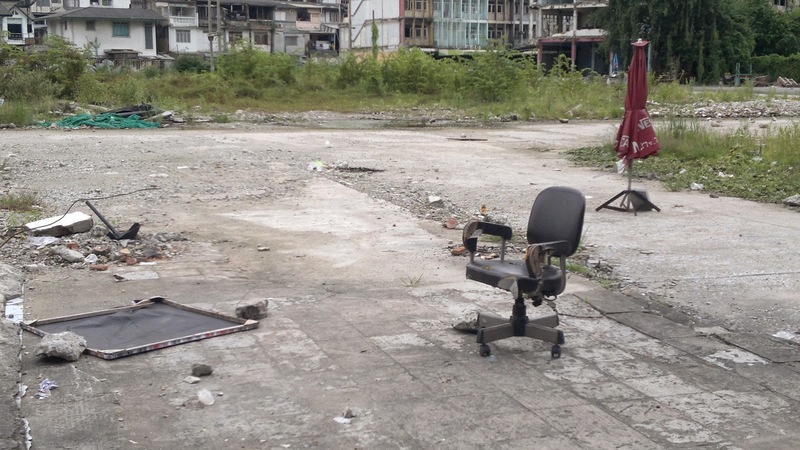 I call this my Bangkok Corporate office, on Sukhumvit road near Asoke BTS....LOL! I loved this image when I saw it, Bangkok is such a city of contrasts. There is old and run-down and new and shiny. There is old world and new world and everything in between. It's what makes Bangkok and Thailand such an amazing place to visit or spend a greater length of time. The photo shows a point between old and rundown and some exciting new development taking shape.